This is about as ‘old school’ as you can get and it’s a dish I have resisted making for ages simply because I wasn’t convinced I could do it justice. I’ve had Ham hock in many forms in many places – I love it as a terrine with pickles and a good bread but the best of the best is slow cooked with mash and cabbage (a vegetable I feared most of my life until I came to my senses). 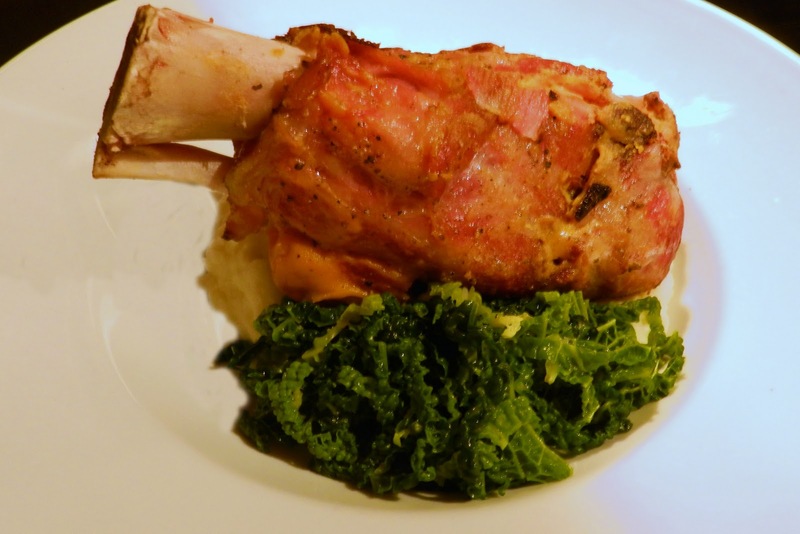 Ham Hock is simply the shank of the pig and as you would expect it needs a long time cooking. It’s really, really cheap and can be really really salty so you need to invest some time with this bad boy in order to blow the pants off your dinner guests! Right, the night before sling the hocks into the sink and cover with cold water. Leave them there over night in order to start the desalination (salt out) process. The next day set aside 2.5 hours – get the hocks out of the sink and into a large pot cover with cold water, add the pepper corns and bay leaves, lid on and bring to the boil. When the hocks begin to boil reduce the heat to a simmer and leave for 1 hour then drain then renew the water (save the old water/stock). Do that twice through the cooking in order to get rid of the remaining salt. After 2.5 hours the hocks will be cooked (falling off the bone) so set aside to cool then remove and bin the skin but leave a thin layer of fat around the hock. When they are cooled you can now baste with the mustard and brown sugar then sling into a full tilt oven to roast up for 30minutes. For your sides make a buttery mash and cook the cabbage in the ham hock water from the first boiling and if you want to be really cheffy then transfer the cabbage into a pan and saute with butter and touch of cream then puree.